I don’t get to work a lot with [some people]. I’ve had a scene with Camren, but I see her around all the time. David and Camren, they’re golden people. They’re beautiful young people. They’re sweethearts, and their parents are cool. Thanks to GothamSite for the heads up! Thanks to GothamSite for the description! The show’s official Youtube channel also released preview clips from the episode, including a scene between Selina Kyle (Camren Bicondova) and Bruce Wayne (David Mazouz)! Watch it below! And last but not least, Fox officially renewed “Gotham” for a second season! I would also say that, initially, we didn’t intend to use Bruce Wayne quite as much, because with child actors you always want to be defensive, but David Mazouz is as good an actor as I’ve ever seen — child or adult. It’s rare that you can write dramatic scenes and be confident that they’ll deliver, and with David, he always does, and he can do more and more. We’ve definitely written to him more than we would have otherwise. David’s been surprisingly enjoyable to watch, especially when he shares the screen with Camren Bicondova’s Selina Kyle. After the way the two parted in the last episode, will we see the two of them together again any time soon? Absolutely. Their relationship grows, develops and changes; they have their ups and downs. They have such a wonderful contrast to each other. Camren is full of such wonderful light and energy, and has this cocky arrogance about her. She’s incredibly compelling to watch. David is thoughtful, interior, intense and passionate, and the two of them together — you could make a great movie just with the two of them. What kind of teases can you drop about the back half of the first season? […] Selina Kyle’s going to do something incredibly shocking […]. One of the things about the second half of the season is that all the story we’ve set up so far comes to fruition. Some people come to an end, other people are triumphant. […] But I guarantee that, if you liked the first half of the season, you’ll love the second half. “Gotham” is back tonight, at 8/7c, on Fox. Stills are also available, but none features Bruce (David Mazouz) nor Cat (Camren Bicondova). And there is more to come when “Gotham” comes back this Monday, with a brand new episode! 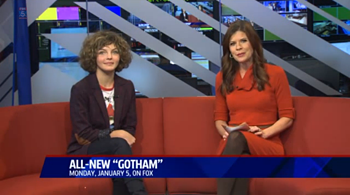 Camren Bicondova is back in her hometown for the end of the year, and she promoted “Gotham” while being interviewed by Fox 5 San Diego. You can watch her interview by clicking the image below, and check some pictures of Camren posted today on Twitter and Facebook to promote her interview!